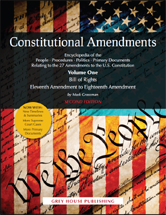 This thought-provoking and interesting text provides a complete examination of each of our nation's 27 Constitutional Amendments. From the prohibition of alcoholic beverages, to slavery, to the voting rights of women, this text illustrates how the US Constitution has changed since its ratification in 1789. Protects individual rights including freedom of speech, freedom of religion, freedom of the press, the right to assemble, the right to bear arms, the right to due process and the right to a fair trial by jury; also, the Bill of Rights prohibits unreasonable searches, excessive fines and cruel and unusual punishment. Suffrage Question, The Charleston Tri-Weekly Courier of South Carolina, 27 February 1869.